Look, if Floyd Mayweather Sr. decides he wants to get in the ring and get some rounds in, that’s on him. Me, personally, don’t want to see old-timers take shots like this, no matter how hard the punches are. 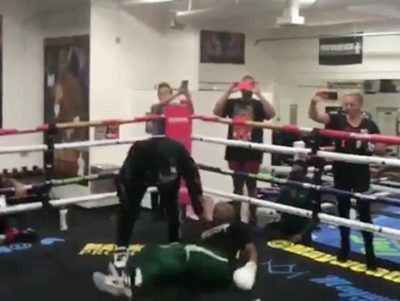 No clue as to why Mayweather Sr. decided to climb in the ring with the young, and heavier fellow; maybe this is a common thing, but this time there were cameras. Maweather Sr. sticks the big boy with a jab, but dude unleashed a combo that sent the Senior to the canvas hard. Check out the TMZ video.